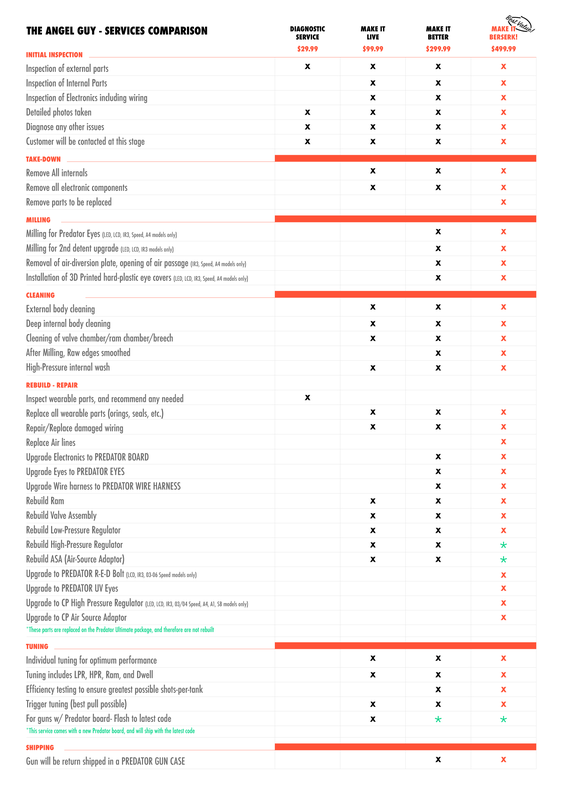 Click here to view a comparison chart of our services. 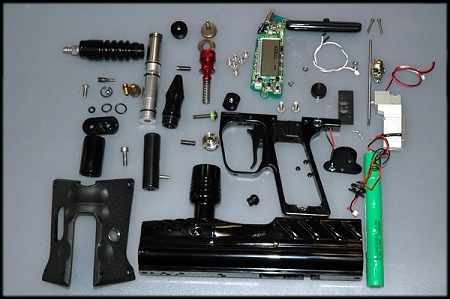 Have a paintball marker that is in disrepair? Trying to figure out how to bring it back to life? The Angel Guy helps you bring your classic paintball gun back to it's former glory days with our best selling service "Make it Live." ‍While working on your marker, we will completely disassemble it. This allows us to replace all of the wearable parts and o-rings, but also allows us an opportunity to inspect the marker and its major parts for any unusual wear and tear, and the potential causes of such wear. If we do discover any major parts are damaged, or worn, we will contact you to discuss any options for repair or replacement. ‍Depending on the type of marker you have, this service will include different procedures, and parts. For all markers every o-ring, seal, and any other wearable part will be replaced; including the inner most valve parts if necessary. Nothing but the highest quality parts will be used for our services. All electronic wiring will be tested for integrity and replaced, repaired, or re-soldered as needed. The costs of these replacements are included in the package. 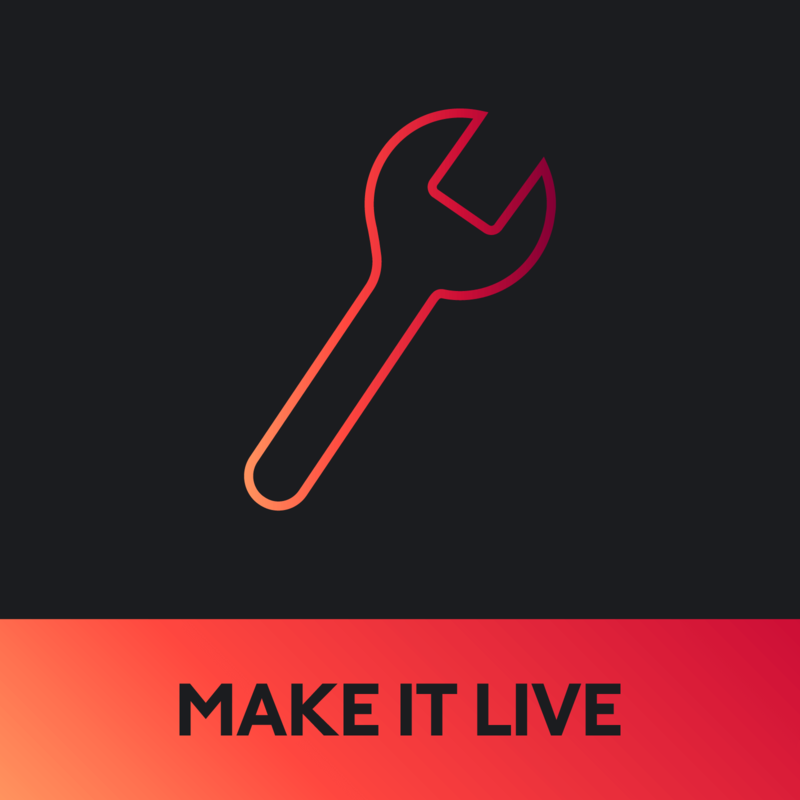 With the "Make it Live" package we completely disassemble your high pressure and low pressure regulator (if applicable) and rebuild the internals replacing all of the o-rings and seals then lubricating them. Only high quality lubricants such as our own Formula 1337 marker grease and Lifeblood oil are used in the rebuild process and are placed on all necessary spots. ‍While your marker is apart, we will give it a very thorough and deep cleaning. We use a variety of cleaning agents and methods to remove all of the dirt, grease, paint, oils, and who-knows-what-else that ends up inside paintball markers. The outside of your marker will also be given a complete scrub down with TAG gun cleaner. If your marker contains any chrome products we will polish them to shine giving your marker that just out of the box look. ‍Once your marker is full reassembled we run it through our gauntlet of quality control tests to make sure that we have it working at its peak performance. Each gun is tested and tuned to optimum consistency in rate of fire, and velocity for operation. Efficiency tests include us adjusting every aspect of your marker (Low pressure, high pressure, spring tensions, electronic settings, etc.) for optimum shots-per-tank. The process is long and tedious, requiring test - adjust - reset - repeat, until the point of maximum efficiency for your particular marker is reached. No two markers will have the same settings for maximum efficiency. It takes a full and complete knowledge of the marker, its aftermarket parts, and the shooting conditions it will be used in to be able to fully maximize a gun's performance in this area. This is why thousands of paintballers have chosen to use the Angel Guy to to bring their gun back to life. Next, your gun's regulators are tested to make sure that they are operating at the correct pressures and that they are recharging fast enough to meet the demand of high rates of fire while staying consistent. Along with air tuning your gun will be timed mechanically (if applicable) and electronics adjusted for the pinnacle of speed and reliability to keep you from breaking paint. If your marker currently has a Predator electronics board in it we will flash it to the newest software free of charge. Finally, we will notify you that your service is done, and on it's way back. We take great care in packaging our gun up to ensure it reaches you safely, and ready to unleash it's paint-filled-fury!We know that you love your classic paintball gun, and it is our goal to help you make it shoot as good as it did the day it was unboxed. This service will do just that! ‍‍Select your gun type from the drop down menu above, then add this service to your cart. When you are ready to checkout, just click "Proceed to checkout" and follow the instructions on the screen. Upon completion of checkout, you will be emailed a voucher to send in along with your gun. Detailed shipping instructions will be on that voucher.